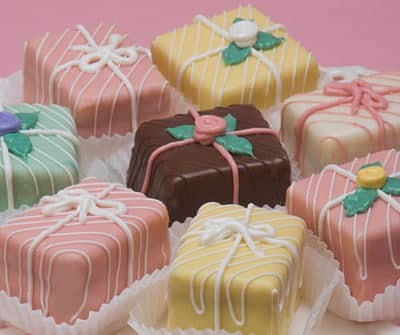 Try our dainty and delectable petits fours gift packages at your next gathering! These are our most popular assortment for spring and summer. These are our most popular petits fours for spring and summer. Dainty and delectable petit four gift packages finished with beautiful pastels, handsome mochas, and chocolates. They are carefully trimmed with delicate ribbons, bows, and flowers. This assortment of favorites includes: White Chocolate, Strawberry, Luscious Lemon, Mocha, Triple Chocolate, Pineapple and Raspberry Creme.